Jerry Ordway can draw anything. His versatility and consistency is what makes him one of the most respected artists working in comics today. He’s a multitalented creator with an impressive portfolio of work that includes penciling, inking, and writing. Over the years, Jerry has touched almost every major character in the DC Universe. The racks are filled with his creativity, which is testament to his focus and passion for comics. He’s a pro, but he’s also a fan, as you can see from his studio. Jerry’s work on “The Power of Shazam” stands as one of the most consistently entertaining titles from the late 90s. It’s a wonderfully charming run that showcases his passion for visual storytelling. 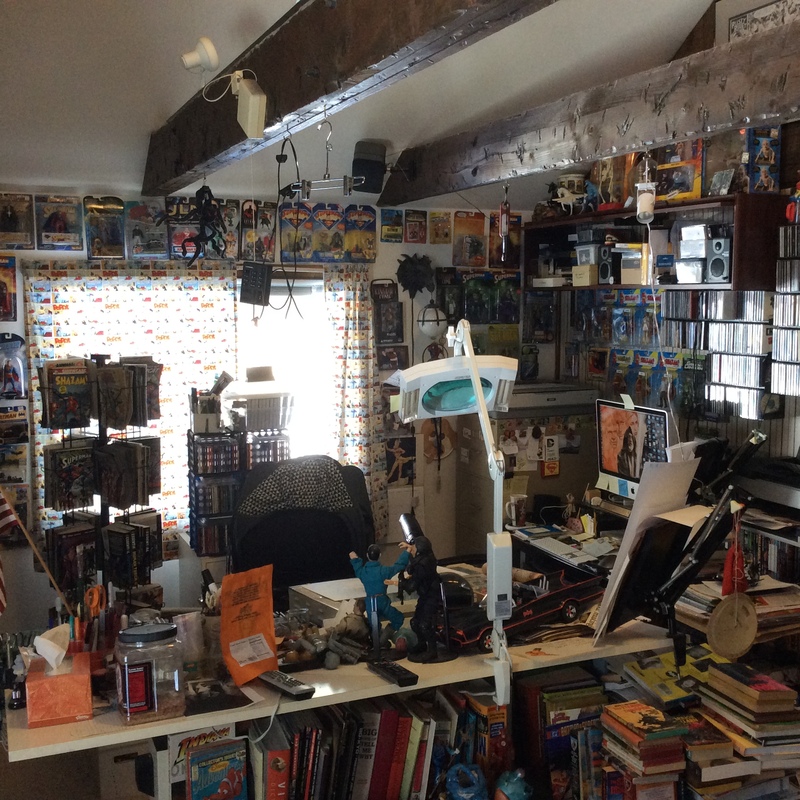 Jerry took a moment to share a few photos of his studio, which is like a fanboy wonderland. Lightbox and action figures in Jerry Ordway’s studio. 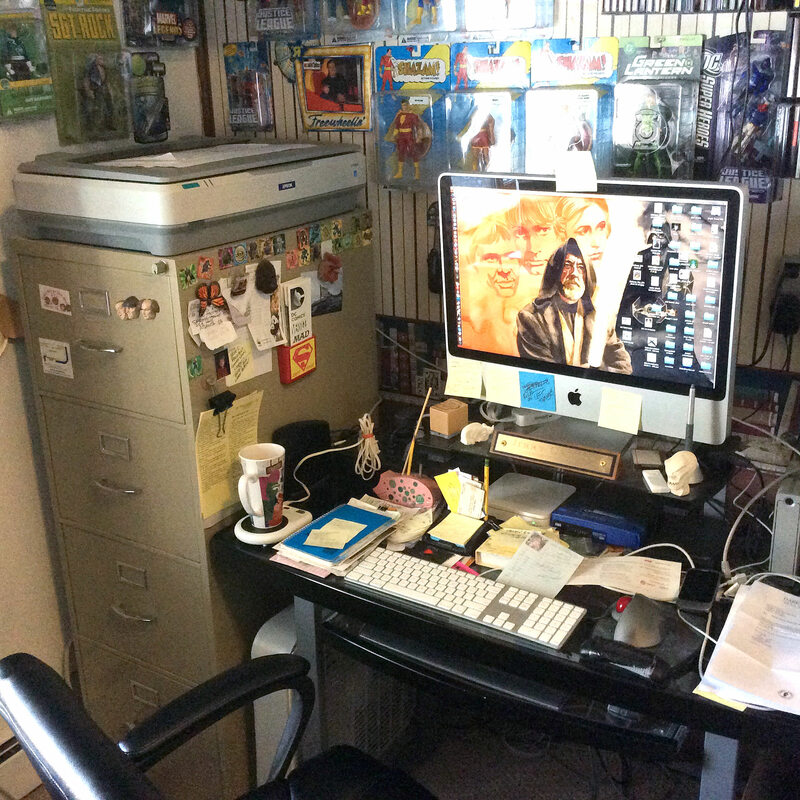 JERRY ORDWAY: I work in a large open dedicated room very close to the front door of my house. There are many windows on two sides, though very little face the sun, so in the Winter it can be a little gloomy. The curtains are drawn in late afternoon, to a view of many trees. 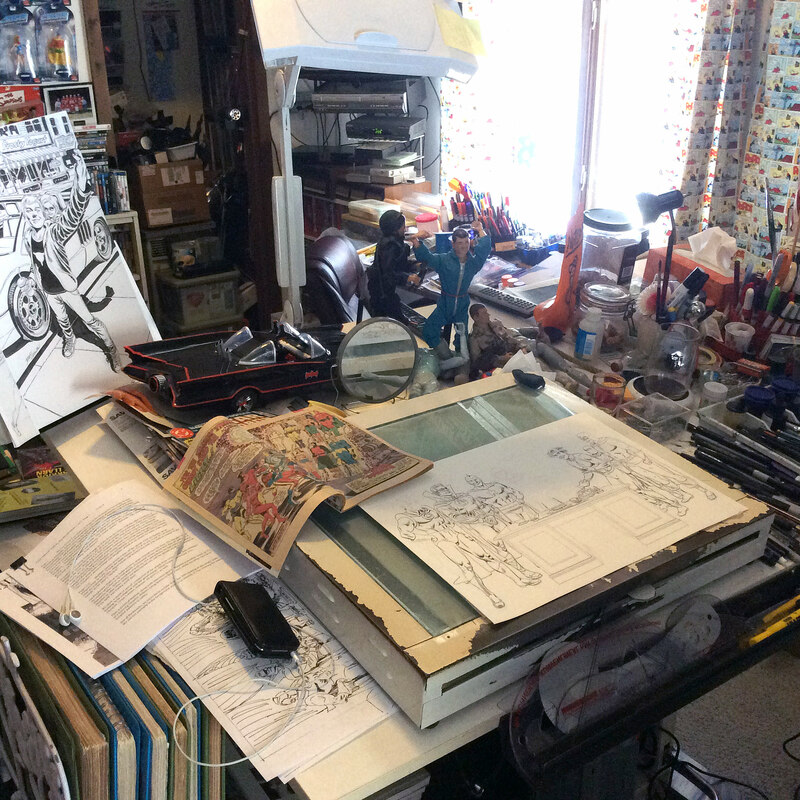 JERRY ORDWAY: My drafting table is 5 by 3 1/2 feet, large enough for a 20×24″ lightbox, and assorted reference, pens, pencils, and a view of my television. The sole electronic device I have on my board is my Ipad, loaded with script or reference, for whatever job I’m working on. My tools of choice are: a few mechanical pencils, loaded with various hardness of pencil leads, many sizes and shapes of Pitt marker pens and brushes, a few dip pens, all Hunt 102 crow quills, and Pelikan yellow label drawing ink. I use a Faber-Castell kneaded eraser, mostly, though I have a Sanford Magic Rub eraser handy for stubborn pencils. A Captain Action doll and an old G I Joe doll are sometimes used for poses, especially generic shadows or lighting, in a pinch. JERRY ORDWAY: While I get up around 11 AM, I work around my family’s schedule, and try to do email and computer work during daylight hours. When drawing, I try to find time where I can work for more than an hour, before running an errand, or taking care of something like dinner. Mostly I am working until after 3 AM. I find that work gets done when I have no interruptions for several hours, which usually means everyone else is in bed, sleeping. JERRY ORDWAY: I am in Dark Horse Presents currently, with a 6 part feature called Semiautomagic, written by Alex DeCampi, drawn by me. Also, drew a variant cover for the relaunch of Archie, and collaborated on a 2 page spread in Justice League#40. Coming up, a 10 page Spongebob Story. 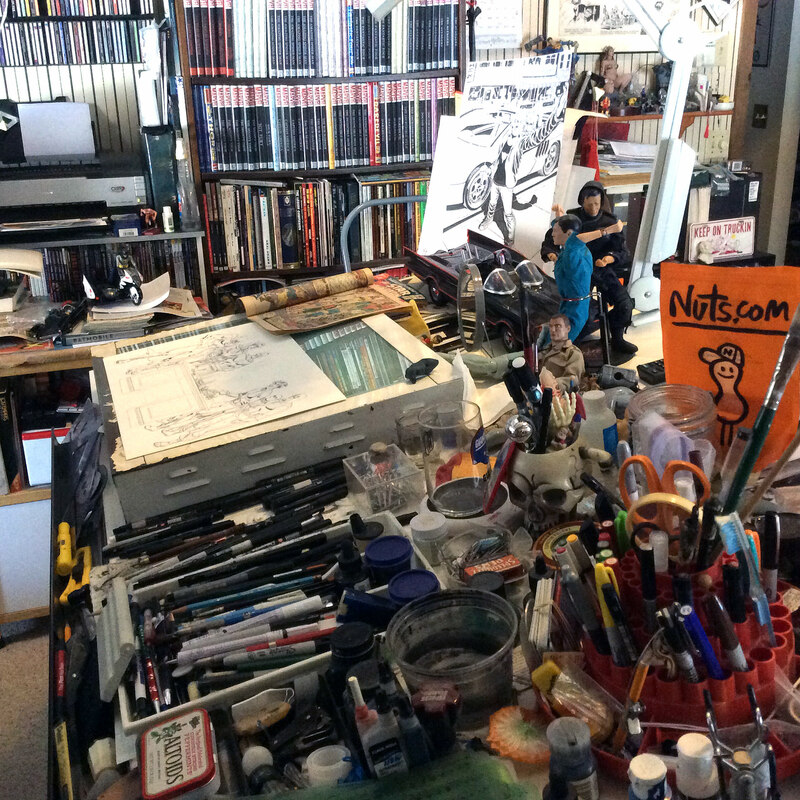 Another view of Jerry’s inspiring studio.